We are garden fairies and we have nearly exhausted ourselves these last few days. It started when the temperature shot up to the low 60's on Monday. We realized then that we had to get our act together and start pulling the crocuses up out of the ground and opening them. Make hay while the sun shines, we say. Today, it was warm again, and so we opened up even more crocuses. We ran around like crazy trying to open as many crocuses as we could because we feel so behind, what with the wicked winter that stayed around so long and all. And then we found out today that the wicked winter that stayed so long and all is coming back and there is going to be a whole bunch of snow tomorrow. Inches of it. Maybe three inches? Or four inches? We are garden fairies and we feel tricked, snookered, had. Now we will be up half the night closing up all the crocus blooms before the rain falls and then snow flies. We must protect the pollen, after all. Really, we are sick of this weather merry-go-round. We had hoped winter was gone but someone must have left the garden gate unlocked because it is coming back. We wish we could stop it, but we can't. We can only do our part to close up the crocus blooms, then we will hunker down and wait for this winter to finally, hopefully, once and for all get the heck out of here. It has to. Carol swears she's planting peas on Sunday. Regardless. Well, at this point, she might need a pick ax to make a furrow for the peas in the frozen ground. Granny Gus McGarden is beside herself worrying about it all. We'll do what we can, but we are garden fairies and we can only do so much. Violet Greenpea Maydreams, Team lead for the best crocus opening team in the world. Winter keeps coming back down here in Texas, too. Aspen Trembleleaf says to tell you she can't remember a winter like this since the garden was born! Lets hope they are wrong about the accumulation! This has been an unbelievable winter for so many! Fernleaf Gravelgardener agrees with Aspen Trembleleaf that this winter has been the coldest in memory. May those pea seeds find safe harbor in soil that is not frozen this weekend! I hope you fairies found a warm place to snuggle yesterday! 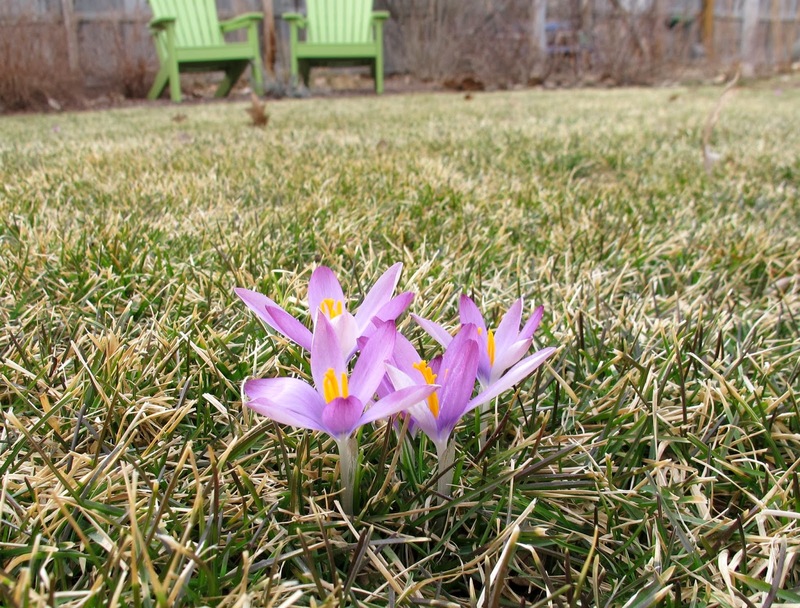 The fairies here must be a little more cynical about spring coming, because not a single crocus has been opened despite the 60 degree weather on Tuesday. Carol, I am so sorry your garden fairies are having such a time of it this spring. Good luck sowing your peas...indoors?